Mountain biking is an incredibly fun and sometimes incredibly challenging activity. It allows you to be able to take your bike and go on infrequently travelled mountain and forest trails and experience them in a completely different way than you would have if you were on foot. Combine this with the fresh air and sunshine, and you will find that it can also prove to be a great exercise routine that can help you look forward to becoming more active. The only problem that people seem to have with it is not knowing exactly what equipment they might need to bring along with them when they are first starting out, but that can be fixed easily. The first thing you will need of course, is some safety gear. This includes a sturdy helmet and a pair of untinted protective glasses, the former to protect your head from a concussion and the latter your eyes from any branches on forest trails or maybe rain if you get caught up in such weather. Next, you should consider bringing a rain jacket in the case that the weather forecast turns out to have been wrong, though it is important to note that these don’t do much to protect you against the cold. And for your legs you should maybe get some knee-pads (along with the matching elbow-pads of course) and a pair of biking shoes that can clip on the pedals and help you keep your footing without much effort. As for equipment for your bike, a few popular suggestions that more experienced cyclists recommend you look into are bike lamps, mud guards and bottle holders. 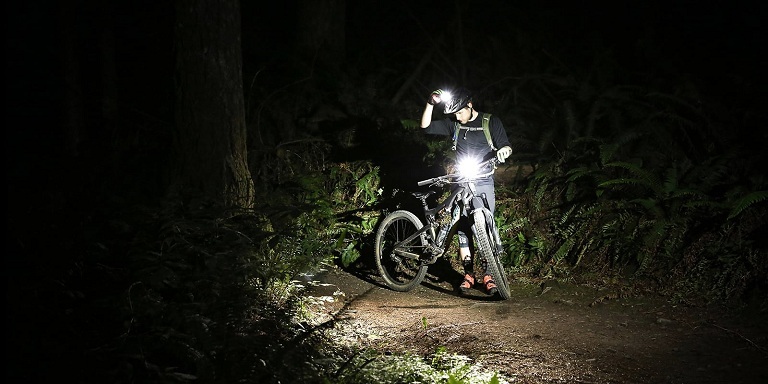 Even if you aren’t planning on going biking at night anytime soon, the bike lamps can prove to be very useful attachments since there are times when a trip takes much longer than you thought and the night has a way of sneaking up on you sometimes, especially in the winter months. If you are going on a mountain trail you will get to a mud-sea at some point, and the mud guards are your life boat in this particular metaphor since they protect you from getting covered in the stuff and having it spray in your eyes or mouth. And the bottle holder is pretty self-explanatory by name alone. Some other pieces of useful equipment include a back pack where you can put your food and a few other items, a multi-tool, which is simply a good item to have in a lot of situations, and a phone in case something goes wrong and you need to call someone. Aside from that, after a while you will get enough experience under your belt that you will be able to tell which other items might prove useful, but at the start it’s highly recommended that you don’t weigh yourself down with unnecessary items.